There are days when I want to eat healthy, and cook good food too. This recipe is made for such days. This mild flavour of this recipe makes it a perfect dinner during summer nights especially if you sip iced lemon tea after dinner. I am making this tonight. Are you? 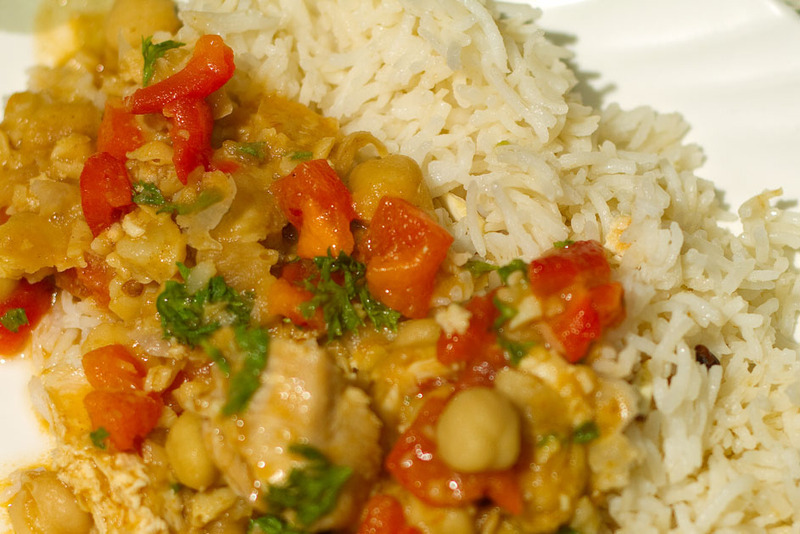 I served this chickpea and chicken stew with lightly spiced rice. To make the rice, fry 1/4 tsp cumin, 4-5 black peppers, 1 bay leaf, a stick of cinnamon in 1/2 Tsp butter. Add the rice, and salt and cook till rice is done. Soak Chickpeas for 7-8 hours and boil them with Salt. This would make about 500 gm of boiled chickpeas. Heat a heavy bottomed pan and pour olive oil. Pat the chicken breasts dry, season with salt and fry the chicken till it's browned. The best way to do this is to not move it for the first 3 to 4 minutes and then flip over and fry for another 3-4 min. Remove the chicken breasts from pan and keep aside. Lower the heat and put crushed garlic to the pan, don't let the garlic brown. Add bay leaves, tomato paste, ground cumin, red pepper flakes and cut tomatoes. Fry till the flavours merge. Scrape the chicken from the pan and let it mix with the tomato and garlic mixture. This will give nice flavour to the stew. Fry this mix for about 30 seconds or so. Add white wine to the pan, scrape the spices and let it simmer for about 30 seconds. Then add about 3.5 cups of water; (If not using white wine, add 4 cups of water). Remember to boil the water before adding it to the pan to reduce cooking time. Add the brown chicken breasts and let it simmer for about 7-8 minutes or till the chicken is tender. After the chicken is cooked, remove from the pan and slice it into bite size pieces. While you are cutting the chicken, add boiled chickpeas to the stew and let it simmer. Taste for salt at this point, and add more if needed. Remember the chickpeas were boiled with salt and chicken was also coated with salt. Take the stew off the heat, add a splash of olive oil (optional, but it gives a nice flavour), add the chopped red pepper, lemon juice to taste, and give it a generous sprinkling of parsley. Serve this stew with a garlic bread or with rice. I prefer rice. Quite interesting and quick recipe one should try atleast twice in a week. Thanx..